The importance of preventing Migraines has never been more clear. Study results are again indicating that Migraineurs who experience frequent Migraine attacks and / or have a long history of Migraines are at increased risk of "silent brain damage," brain damage that (so far) does not seem to cause any symptoms. This again shows that reducing the frequency of Migraine attacks (aka Migraine headaches) is critical. Up to one-third of Migraineurs experience Migraine with aura (MWA). Adult women are affected by Migraine three times more than men. An estimated 20% of the population will develop Migraine disease in their lifetime. Clinical studies have reported Migraine as a risk factor for ischemic stroke in women. In a large-scale population-based study, "silent" brain damage is more frequent in people with Migraine than in people without Migraine. Migraineurs who experience MWA have an increased risk of white matter lesions, and the risk of such lesions was increased even more with increased Migraine attack frequency. This suggests that Migraine may be a progressive brain disease. In previous studies, the specific sites of brain damage weren't specified, and only visible lesions were studied. Study Objective The objective of this study was to identify likely sites of brain damage caused by Migraine and to assess whether migraine attack frequency and disease duration (lenght of history of Migraine) are indicators for brain abnormalities in Migraineurs. The researchers studied 28 patients with Migraine using high-resolution T1- and diffusion-weighted MRI and other advanced technology to identify areas of any damage to the brain. The researchers also used the technology to examine the brains of 28 patients without Migraine, a control group. Potential participants for both groups were examined to exclude patients with any conditions that could affect the brain. No participants had a history of any major medical conditions other than Migraine. Results from the two groups were analyzed and compared. Study Migraineurs with a high frequency of Migraine (more than three attacks per month) showed significantly more abnormalities than those with fewer attacks. Study Migraineurs with a history of Migraines longer than 15 years were found to have more changes in the brain than those with a shorter history. Both the frequency of Migraine attacks and the length of history of Migraines are indicators for brain damage in Migraine. Attack frequency and disease duration have an influence on brain structure and integrity in Migraineurs. Migraineurs with higher frequency of Migraine attacks showed abnormalities in both white matter and grey matter of the brain. 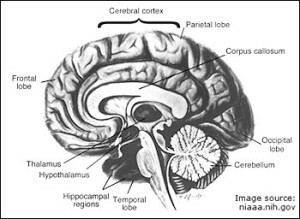 The frontal lobe was shown to be one of the most prominent areas of brain abnormalities in Migraineurs. High frequency of Migraine attacks or a long history of the disease might contribute to accumulating brain damage due to the repetitive occurrence of pain-related processes, thus making Migraine a progressive disease. The bottom line here is that this study provides evidence that frequent Migraines and having had Migraines for longer than 15 years significantly increases our risk for brain damage. This provides more evidence that Migraine is indeed a progressive brain disease. It is also of significance that Migraine is repeatedly referred to as a disease by these authors. If reducing how often we're in pain or incapacitated by Migraines isn't enough to encourage us to keep pursuing an effective preventive regimen, the results of this study certainly should be! The brain damage found may be said to be "silent" at this time, but it is not safe to assume that it is indeed silent. It will take many years of longer studies following Migraineurs with this type of damage to know if it will eventually cause symptoms, perhaps severe symptoms. If you experience three or more Migraine attacks per month, please talk to your doctor about preventive therapies. There are now more than 100 medications, supplements, and devices available for Migraine prevention. For more information and a list of potential preventives, please see Migraine preventive medications: too many options to give up! Related article: Is Migraine a Progressive Brain Disease? Schmitz,Nicole, PhD; Admiraal-Behloul, Faiza, PhD; Arkink, Enrico B., MD; Kruit, Mark C., MD; Schoonman, Guus G., MD; Ferrari, Michel D., MD; van Buchem, Mark A., MD. "Attack Frequency and Disease Duration as Indicators for Brain Damage in Migraine." Headache 2008;48:1044-1055. doi: 10.1111/j.1526-4610.2008.01133.x. "Brain damage risk linked to migraine frequency." Reuters Health. August 25, 2008.